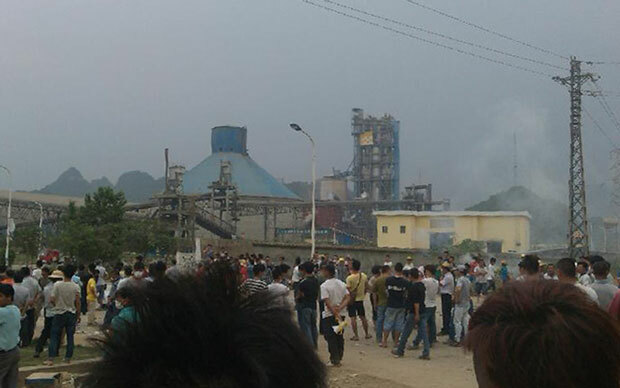 Plans for an incinerator in Langtang township, Luoding city, belonging to China Resources Cement Holdings, were discarded after demonstrations by citizens and clashes with the police in April 2015. 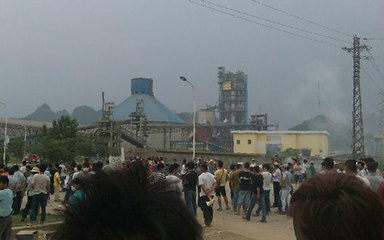 Cement factories want to burn waste. Citizens think this is dangerous. On 9th April 2015 the government of Luoding City, 180 km west of the provincial capital Guangzhou, said on its website it was canceling approval of an incinerator due to be built at a local cement works, “in response to public demands”  . As many as 10,000 people then took part in a demonstration the following day, to protest against the violence, according to the paper, and local schoolchildren also seem to have boycotted classes in protest. Photographs showed police with helmets and riot shields in a face-off with protesters outside the local government headquarters of nearby Langtang township. The clash is one in a series of demonstrations against waste disposal incinerators located near heavily populated urban areas, which have highlighted environmental tensions caused by the rapid growth of China’s consumer economy -- and of resultant waste. 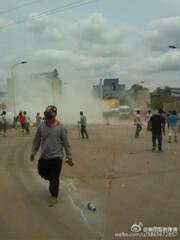 Last year, a similar project in Hangzhou in eastern China was suspended following public protests. And there have been a string of protests against incinerators planned for the Guangdong provincial capital of Guangzhou in recent years. Some experts say the protests are an example of "Nimbyism." Ma Jun of the Institute of Public and Environmental Affairs in Beijing, told the Global Times that using high temperature furnaces like those in the cement works to burn waste released relatively little pollution. However, he acknowledged that some pollution was inevitable, and that to avoid future conflicts there was a need for “more transparency and information disclosure,” and public consultation about such projects. A series of environmental disasters has fueled public concerns about such projects in China. In a comment emailed to International Business Times, Ma Tianjie, mainland China program director at Greenpeace East Asia, said local officials should “serve more as a steward of due process," guaranteeing “the public's right to know and participate in decision making” regarding such projects . Development of Alternatives Luoding city government in Guangdong province said that the project fit a national policy to encourage solid waste processing in the cement industry, but that it was cancelled "in response to public demands." Thousands of residents fearful of pollution clashed with police. A resident surnamed Huang was quoted as saying that people also wanted the company that was to build the incinerator to reduce pollution at its local cement factory. Why? Explain briefly. In April 2015 the government of Luoding City acknowledged after demonstrations and clashes with the police, that in response to public demand it was cancelling approval of the incinerator due to be built at a factory belonging to China Resources Cement Holding in Langtang. China Scraps Waste-Incinerator Project Amid Protests. Chinese residents are increasingly willing to oppose government plans seen to be polluting. CHUN HAN WONG, April 9, 2015.